Rasam is a south Indian soup that can be made with vegetables or lentils. Different regions have different versions of rasam and each one is as delicious. The spices, herbs and souring agents used for making rasam are supposed to be healing and it really works wonders during a flu or for people recovering from sickness. The recipes can be modified a bit to suit the specific requirement, like one would add a little more peppercorns or long pepper when recovering from fever. I had a horrible episode of Chikunguniya and I was not alone in this agony. Arvind also got the bug and we both got it from my brother who was staying with us during his sickness. That makes 3 of us in a family and there were (and there are) many more people in Delhi suffering from Chikunguniya right now. It is not a fatal illness but it is so painful you would wish it goes away from the world forever. Even after three weeks my joints are stiff and painful and I haven't been able to resume full fledged work routine. 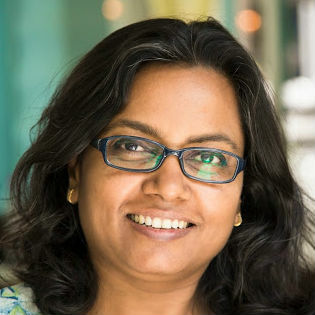 I had to hire a cook immediately and only after about 2 weeks of being totally bedridden, I started making some herb teas and rasam for ourselves as the taste buds had gone numb. I devised new easier ways to make my rasam and adapted the recipe slightly to suit our needs. Both of us needed to ease out the pain and stiffness in the joints and to strengthen the body too. 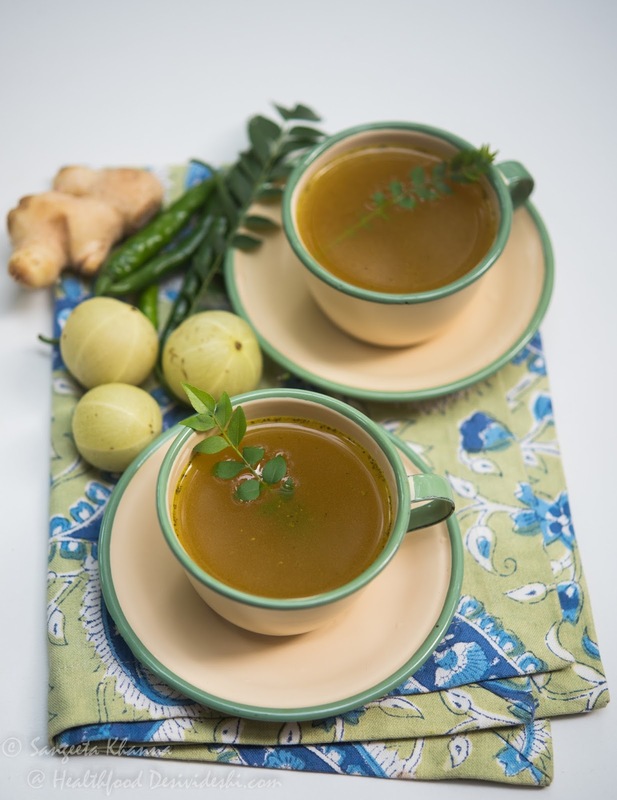 Sharing the Amla Ginger rasam, Pineapple rasam and Beetroot rasam here and each recipe is suited for convalescing. Pressure cook the amlas and roughly chopped ginger along with salt and 2 cups of water. Let it cool before proceeding. Separate the boiled amla and ginger from the stock, remove the seeds of amla, reserve the stock for later use. Now make a coarse paste of green chillies, curry leaves, peppercorns and cumin seeds without adding any water. Heat ghee in a pan, add the hing and then the coarse paste of curry leaves etc. Lower the flame and add turmeric powder and saute the mix till it gets aromatic. There will be very little ghee but keeping the heat low will help to make this tempering mix fragrant. This tempering was almost the same in all the rasam recipes I tried in the last week. Make a paste of the boiled amla and ginger in the same blender jar and pour it into the pan as soon as the tempering mix gets aromatic. Add the amla ginger stock and 2-3 cups more water. Let the rasam simmer for at least 15 minutes. Try and not let it boil as the aromatics escape this fragrant rasam when it starts boiling. You will notice some froth while it simmers and that is a good sign. You can pour the rasam directly in serving bowls or cups but I preferred straining it using a tea strainer as I wanted a clear soup that feels pleasant to drink. This amla ginger rasam is hot sour and spicy and quite aromatic with the hing, cumin and curry leaves. It has been the most frequent recipe in my kitchen for the last couple of weeks. Pressure cook the grated beets with 3 cups of water and salt. Strain and use the stock. You can blend the beets to make the rasam but I preferred not to fill myself with it as I needed to eat some protein rich foods too. I recommend straining the stock if you are making the rasam for healing as the nutrients are absorbed quickly this way. Make the tempering just like the amla ginger rasam and pour the beetroot stock before simmering the rasam for at least 15 minutes, add a little more water if required. Add the souring agent of your choice and balance the seasoning. The bright colour of beetroots will be masked by the turmeric and curry leaves but it is for the good. 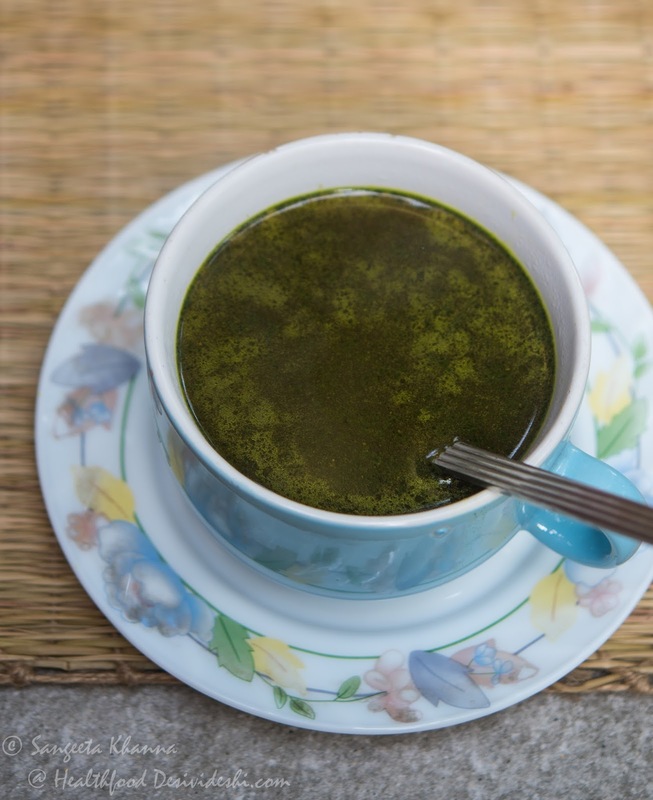 More antioxidants and more anti inflammatory agents in this rasam make it absolutely fit for convalescing or even for those who need to heal the body after heavy workouts and sports practice. I used pineapple from my freezer that I keep for making juice blends, to make it even short I sometimes use pineapple juice from a carton. Replace the green chillies with dry red chillies for pineapple rasam, and do not blend them with the other ingredients. Make a paste of the chopped ripe pineapple and grated ginger. Prepare the tempering blend without the chillies and keep aside. Heat ghee, add the hing and broken red chillies and let them get aromatic before adding the coarse paste and turmeric etc. Once all of this is cooked and fragrant add 4 cups of water and the pineapple paste. Add salt, adjust seasoning and simmer for 15 minutes, add lime juice as required. Initially I had this without straining but later I started straining this pineapple rasam too as it felt better that way. 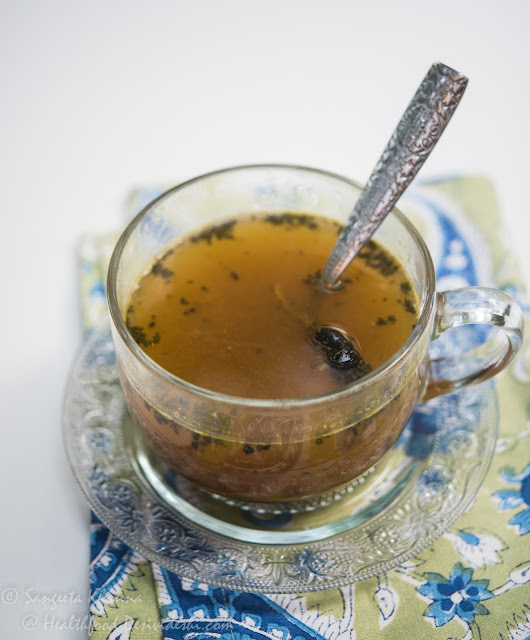 This is a hot and sweet type of rasam that most people tend to like. I have made pineapple rasam earlier too and using the pineapple juice from carton comes handy when you have to make it for a crowd. 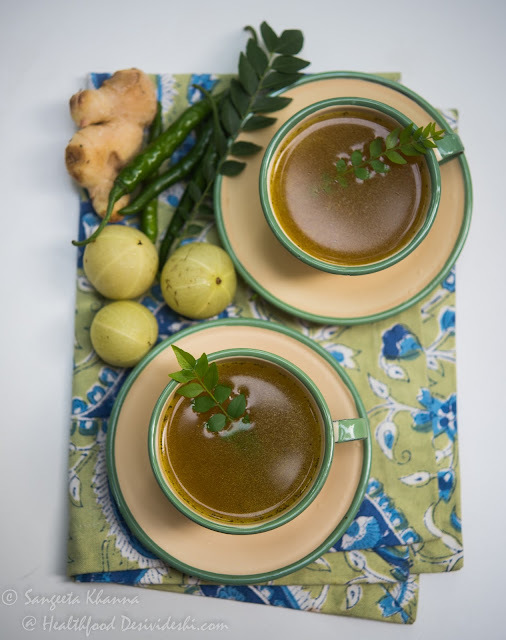 Hoping these three recipes of rasam will help anyone who is recovering from sickness. These helped me revive my taste buds as well. Rasam can be made using lentils too and those are a little thicker, to be consumed like a soup or with some rice in it. The vegetable based rasam can be made similarly using other vegetables like tomatoes, drumsticks or even coriander roots and stems. The tempering can always be adapted to personal choice. The rasam powders available in the market are great too but I had none this time. What is your favourite rasam? Rasam and steamed rice with a huge bowl of palya (stir fried vegetables) is my favorite comfort food! Am surely going to be trying the amla ginger one Sangeetha. Thank you so much Suma. I am not sure if these rasams will be suitable for a rice and rasam meal as I intended them to be like clear soups. But I am sure you would love the taste. Thank you so much Sonali. Hi Spice. The chikunguniya joint stiffness and pain wouldn't go easily. It takes its own time as the doctor told me too. Even after 2 months my joint pain still continues :-( but having a lot of fluids and such anti-inflammatory foods helps in managing it a little better. Rest is the key as well as stretching the limbs and joints regularly, no rigorous workouts for some time. Hope it helps.